Politicians must surely hate the club lobby. Many ordinary people (like me) detest them for the harm they do to the most vulnerable members of the community through their frantic lobbying for poker machines. For a politician, the club lobby is a disproportionately powerful lobby that wields huge power over politicians. Federally we are presently seeing the level of public outrage that the clubs are able to incite over Mandatory Pre-Commitment. In NSW, lobbying is a particularly sensitive area for O'Farrell, for two reasons. First, he will remember that the level of corruption (perceived or otherwise) that NSW Labor demonstrated was a major part of their downfall. Moreover, there are already unhealthy links between the Liberal party and lobbyists. I wrote here about Michael Photios, Vice-President of the Liberal State Executive by day and a hotel lobbyist by night. There is now another line of attack on the government, although whether they deserve this attack is less clear. There are two pieces presently available on the Herald website: here and here. Along with the NSW head of the AHA he met with O'Farrell on 17 June to voice concerns about the "three strikes and you're out" policy. On 1 September he resigned for "health reasons"
A few further facts. First of all, Ross stepped down from the AHA in 2008. He's hardly stepped straight into a new position. Having said that, it is a little hard to perceive what his involvement with the AHA was after he stepped down as its head. The Herald describes him as a "paid lobbyist". Sky News calls Ross a "lobbyist from the Australian Hotels Association" whilst this article says that he "was still on its payroll as a lobbyist." And, of course, he was at this meeting with O'Farrell on 17 June. In the absence of evidence to the contrary, I don't see any reason to doubt this to be a fair assessment. To my mind, there are two issues here. The first is his background and therefore his suitability for the role, and the second is whether there has been "corrupt conduct". On the first issue, the Herald describes the appointment of a person with a background in the Hotel industry to the role as being "unprecedented". I've tried to find out the backgrounds of the other members. Chris Sidoti, the Chairman, was previously the federal human rights commissioner. David Armati is a magistrate who has long experience as chairman of the NSW Liquor Administration Board. Sharryn Brownlee is President of the Central Coast P&C Association. Ken Brown AM was formally Director-General of the Department of Gaming and Racing. David Greenhouse, as Chief Executive, appears as best I can tell to have been promoted from within the organisation. The fact that the organisation is new means that there is little history to draw on to work out whether the appointment is in fact unprecedented. It is especially worth noting that the Authority is responsible for the regulation of Star City, not hotels or clubs. I've seen nothing to suggest that there is a explicit conflict of interest. 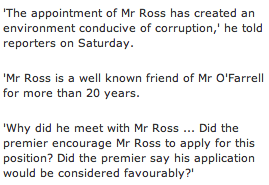 In short - I've found nothing that suggests that Brian Ross was not a suitable person for appointment to the board. Indeed, his experience suggests that he may in fact be highly suited. In fairness, I don't think anyone has explicitly suggested that he was not, and the article from the Herald only implied it. The real issue is whether there has been corrupt conduct. Robertson has "called on" ICAC to investigate the matter, so it's clear that either he thinks there has been corrupt conduct or he wants everybody to believe that there was. To me, that seems pretty thin grounds for an allegation of corruption. For me, O'Farrell is free to encourage anyone he wants to apply for a job, or to say that he thinks that someone has a good chance. As long as he is in no way involved in the selection process, then what could possibly be wrong with that? Where is no evidence that there has been any wrong-doing by O'Farrell (other than an apparently spurious allegation of unsuitability, a suggestion of a long-standing relationship and a potentially coincidental timing) then it is irresponsible of Robertson to call on ICAC to investigate. Unless Robertson has some actual evidence of wrong-doing, then all he is doing is flinging some mud at O'Farrell and Brian Ross, in much the same way as I suggested he was doing with Andrew Stoner. The saddest thing of all (assuming that everything O'Farrell has done has indeed been kosher) is that Brian Ross has now resigned his seat. Maybe he was pushed by a nervy government. Maybe he saw what was about to happen. Or maybe he really does have health issues that need to be addressed. I have no idea whether he was a good appointment, but assuming he was, NSW may have lost a fine appointee who would have served the state well. It's a tough game, politics.